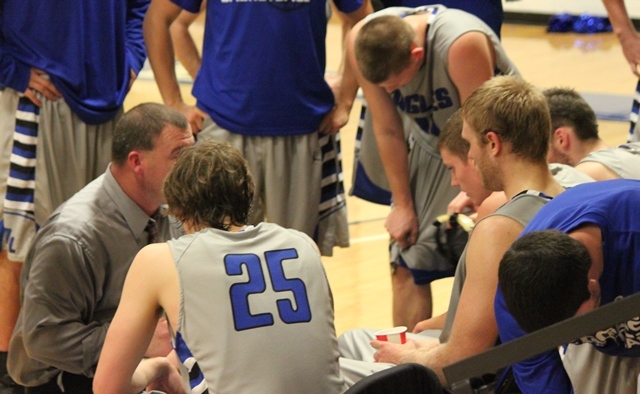 The Alice Lloyd College Eagles traveled to Cincinnati, Ohio to battle the Cincinnati Christian University Eagles. In a wild shootout, ALC fell by the score of 105-93. In the opening half, CCU came out of the gates with guns blazing. However, Alice Lloyd was up to the challenge as both clubs put points on the board at a frantic pace. When the buzzer sounded to end the half, ALC led 49-47. The second half started where the first one ended as both teams looked to push the tempo. Alice Lloyd added 44 more points to their total in the final stanza, which normally would be enough to salt away a victory. Unfortunately, Cincinnati did them 14 better as they accounted for 58 second half points and managed to pull away down the stretch. On the night, ALC shot a solid 50% from the floor (35-70) compared to CCU’s 52.6% (41-78). ALC outscored their foe from the charity stripe 18-8. The all-important rebounding battle was nearly identical, as well (38-37, CCU). The difference in the game came from behind the arc. Cincinnati connected on an incredible 15 long range bombs, compared to just 5 for Alice Lloyd. That amount was just too much for Coach JR Hammond’s squad to overcome. For ALC (10-8, 2-2 KIAC), five players reached double figures in scoring. They were led by freshman Tyler Ailshie and sophomore Isaac Wilson with 18 and 16, respectively. Junior Shawn Thompson tossed in 14, while sophomore big man Terry Muse and senior Brandon Hayes contributed 13 and 10 points. Muse also hauled down a team high 9 rebounds, while Ailshie and Thompson registered 3 assists each. CCU (5-10, 2-2 KIAC) was paced by Kevin Mitchell with 25.